Looking for a quick and easy Teacher gifts this year, we have an easy but practical gift any teacher will be thrilled to receive from their students. Teachers always need liquid soap and hand sanitizer in their room. 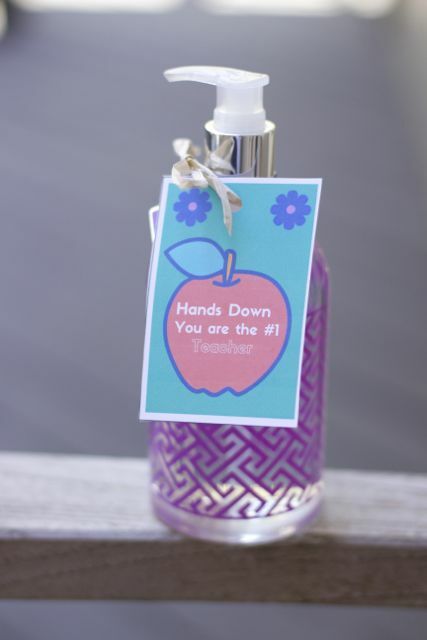 With this teacher appreciation gift soap you have their germs covered!! Teachers get so much in the way of food treats, that this will be a gift that you can give them all year long and they will be thankful. 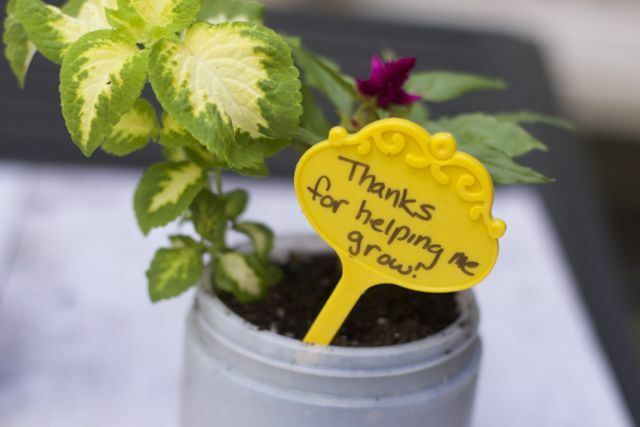 Teachers are not looking for extravagant gifts for Teacher appreciation week, just small gestures to let them know they being appreciated. 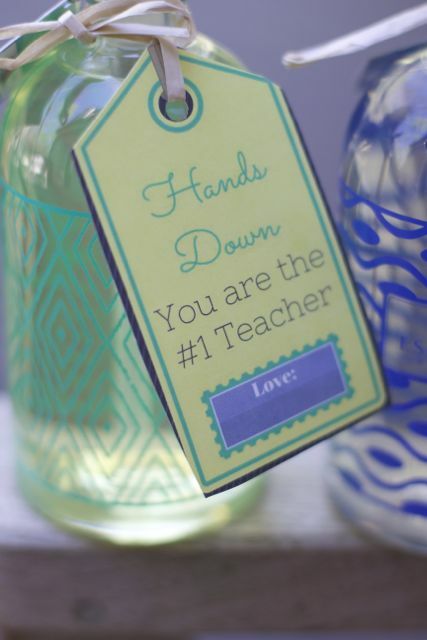 With the free teacher gift printable and a lovely scented soap or hand sanitizer dispenser you can pull this gift together in just a few minutes. I promise I won’t tell that it was a last minute gift idea, it is the thought that counts. 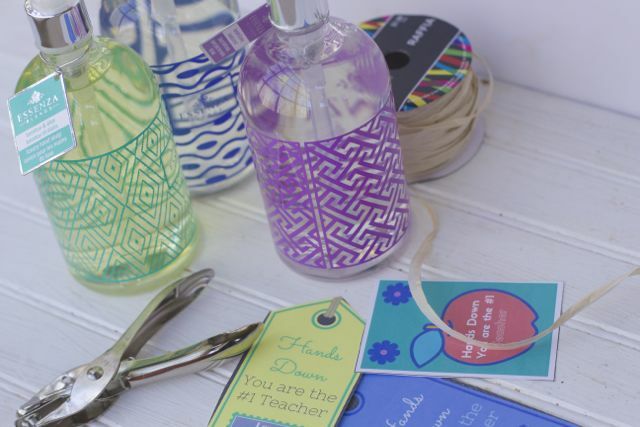 All you need to do to make this simple teacher gift is find a decorative hand soap container. I loved the new design on the Essenza soaps. 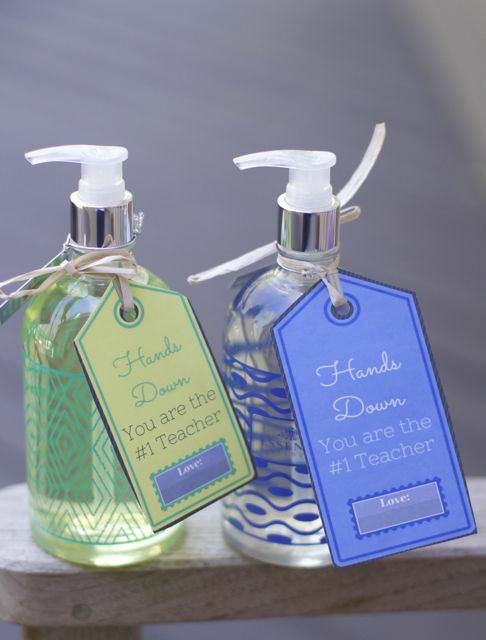 Their clean design is almost too cute for the classroom, your teacher may bring home this Teacher gift soap! 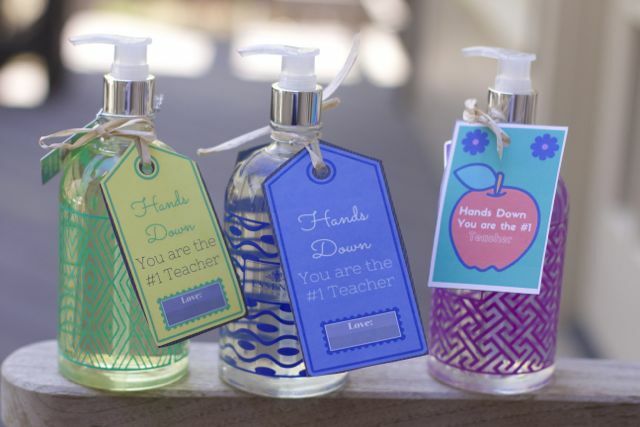 We designed a few different Teacher gift soap tags for you to choose from. Hands down your the best teacher is just what any teacher wants to hear all year long. Be sure to pick up a few of these teacher gift soap for your own house too. Make a few extra for the special teachers in your children’s lives too. 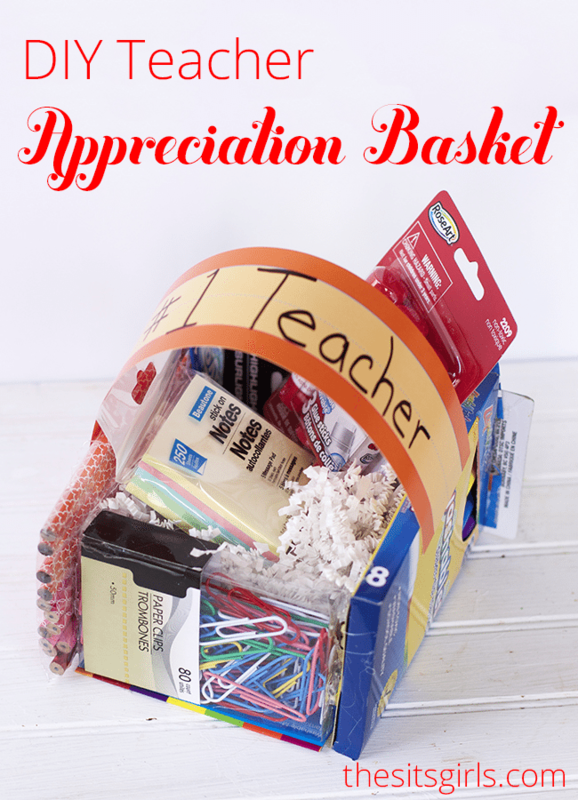 teacher appreciation gifts under $5. Thank you… Im trying to be prepared but for the life of me i couldn’t figure anything out. This is perfect. What a clever and creative idea! I was just thinking about how I need to start looking for teacher gifts since it’s almost summer time. Thanks for sharing, will use this for sure! The different scents sound like they all smell lovely and I know a few teachers that would greatly appreciate a gift like this. The custom tags are too cute. 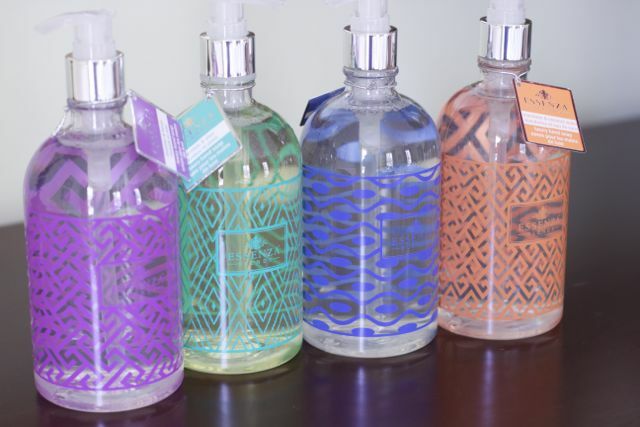 The designs on those soap bottles are gorgeous! I’m sure the gift recipients are going to love these gifts! I love giving gifts that are edible or useable!! 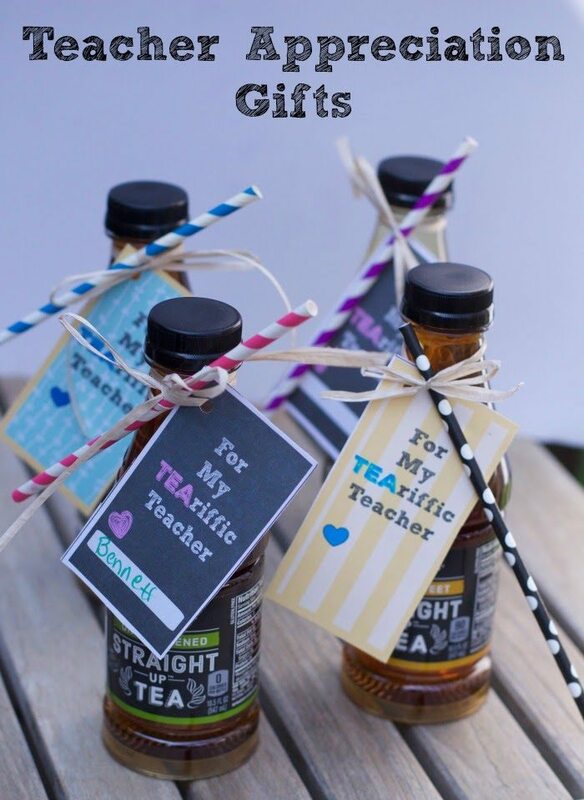 Those are perfect teacher gifts. We have teacher friends and they always get so many “useless” gifts….this I know they would love.